Sweet corn (Zea mays rugosa*) is not only one of the most common but also one of the most important of vegetable crops. Like field corn it may be grown on a wide variety of soils. A corn plant requires more space than does the individual of any of its cereal relatives. In many varieties the production of suckers or secondary stems or branches from the lower nodes is very pronounced. These branches develop their own roots. * The nomenclature is according to Bailey, L. H., "Manual of Cultivated Plants," 1924. Sweet corn of the Stowell's Evergreen variety, a standard, main-crop variety, was planted June 2. This is one of the old, well-known, and most important canning varieties. It produces a rank growth. The hills were spaced 42 inches apart and three to four plants were permitted to grow in each hill. The grains were planted 2.5 to 3 inches deep. Weeds were kept in check by repeated shallow cultivation. Early Development.--An initial examination was made June 18, only 16 days after planting. The plants were 7 inches tall, in the sixth-leaf stage, and had a leaf spread of 8 inches. The total leaf surface averaged 45 square inches. Unlike field corn, which usually has three roots making up the primary root system, sweet corn has but one. This seed root was already 18 inches long on most of the plants examined. Thus, allowing 3 or 4 days for germination, it had grown at the rate of over 1 inch a day. The direction of growth was not downward but obliquely outward and downward. The lateral spread was sometimes more than 1 foot, but none penetrated deeper than 11 inches (Fig. 3). The last 3 inches of root were unbranched but the remainder was covered with branches at the rate of 25 per inch. The younger ones were scarcely 1/4 inch in length, but toward the seed they became progressively longer and many on the older portion of the root were 3 inches long. A few were even more extensive, reaching a maximum length of 10 inches. The longer and older laterals were densely rebranched with laterals seldom exceeding 1/4 inch, but the younger ones were simple. Occasionally, a second long root arose from the base of the stem near the seed. one of these is shown in the drawing. Fig. 3.--Root system of sweet corn 16 days after planting. The growth of the secondary root system is well under way. The secondary root system,. originating from a node on the stem about 1 inch below the soil surface, had also begun to appear. This consisted of 6 to 10 rather thick, mostly horizontally spreading roots. Apparently these were of rather recent origin but were developing rapidly. Some were 8 inches long, others just emerging from the stem. The younger and shorter ones were smooth and unbranched like the 3 to 4 inches on the ends of the older ones. Otherwise short branches occurred at the rate of 20 to 25 per inch. Root hairs were very abundant and the roots were so covered with adhering soil particles, except the shiny white ends, that they appeared very thick and black even after removal from the soil. Figure 3 shows that the total absorbing area of the roots really was quite large. In the case of field corn it has been found to exceed that of the tops. Relation of Absorbing Area to Soil Moisture. 169--In one experiment Nebraska White Prize dent corn of the F1 generation from two pure-line parental strains and, consequently, of similar hereditary constitution was grown for 5 weeks in fertile loess soil with original water contents of 9 and 19 per cent, respectively, above the hygroscopic coefficient. The plants were in the eighth-leaf stage when the roots were examined. In the more moist soil the area of the tops, including the stem and both surfaces of the leaves, was 82 per cent of that of the roots. But in the drier soil the tops had only 46 per cent as great an area as the roots. In other words, the absorbing area of the roots (exclusive of root hairs which covered the entire root system) was 1.2 times as great as the area of the tops in the more moist soil and 2.2 times as great in the drier soil. The total length of the main roots in the two cases was about the same, as was also their diameter. In neither case did the main roots make up more than 11 per cent of the total absorbing area. In the drier soil 75 per cent of the area was furnished by the primary laterals and the remaining 14 per cent by branches from these. But in the more moist soil the primary branches furnished only 38 per cent of the root area. It seemed as though the plant had blocked out a root system quite inadequate to meet the heavy demands for absorption made by the vigorous tops, and as the soil became drier the remaining 51 per cent of the area was furnished by an excellent development of secondary and tertiary branches. Maize, in loess soil with only 2 to 3 per cent of water in excess of the hygroscopic coefficient, had, in proportion to the length of the main roots, about one-third more laterals than it had in a similar soil of medium water content. Moreover, the absorbing area in comparison to tops was greater. Similar top-and-root area relations have been found to hold for other plants when grown in like soils of different water content. Numerous experiments have shown that root extent is greater in dry Soil. 68 Because of the difficulty of recovering the root system in its entirety from the soil and the onerous task of measuring the length and diameter of all its parts, but few data are available. For example, a plant of maize only in the eighth-leaf stage has from 8,000 to 10,000 laterals arising from the 15 to 23 main roots. Usually the relations are stated in the ratio of the dry weight of roots to tops, an expression difficult of interpretation in terms of function. The larger, thicker, and heavier roots are least significant, the delicate branchlets, too often lost in such determinations, being of greatest importance although adding little to weight. Midsummer Growth.--A second examination was made July 27. The plants had a height of about 4.5 feet and were very leafy. The parent stalk had usually given rise to two to four tillers but sometimes there were as many as six. The very numerous leaves, averaging 2.5 feet long and 3.5 inches wide at the base, offered a very large area for food manufacture and transpiration. For example, one plant with four tillers had a leaf surface of 20 square feet. The tassels were about half out. The root system had made a really wonderful growth and was clearly in a state of very rapid development. After considerable study a plant with four tillers was selected as typically representative, and was fully examined and described. There were 45 roots of larger diameter, 3 to 4 millimeters. These were older and longer than the others. Another lot of 15 roots were about, 1.5 millimeters in diameter and also extended widely. In addition there were 33 young roots of a diameter of 1.5 to 3.5 millimeters and of an average length of 4 inches (varying from 1.2 to 8.5 inches). Finally, 29 smaller, fine roots only 0.5 millimeter thick and about 2 inches long arose from the root crown. It is impossible to represent all of these in detail in the most carefully executed drawing. But at least the principal features can be clearly portrayed (Fig. 4). Fig. 4.--Root system of sweet corn 8 weeks old. The primary root (often erroneously called temporary), which could still be easily identified, pursued an obliquely downward and outward course, ending 28 inches horizontally from the base of the stalk and at a depth of 37 inches. Only a few roots penetrated deeper. One, however, was found near the 4-foot level, but the usual depth of maximum penetration scarcely exceeded 3 feet. The working level was at a depth of 2 feet and a maximum lateral spread of 3 feet had been attained. The working level, or the working depth, means that to which many roots penetrate and at which much absorption must occur. The thorough occupancy of even the surface 3 inches of soil and the competition of the roots between the 42-inch rows may be plainly seen. The lax, meandering course of the longer main roots of the adventitious or secondary root system was such as to ramify the soil completely from the surface to directly beneath the plant. These strong, tough roots were 3 to 4 millimeters in diameter at their origin and maintained a diameter of 1.5 to 2 millimeters to their tips. They were extremely well branched. Only the 3 to 5 inches of the rapidly growing root ends were free from branches. The branches were usually most numerous and often longest throughout the first few feet of their course. Here they were frequently distributed 18 to 25 per inch, but they were profuse throughout, i.e., 8 to 12 per inch. All of the branches are not shown in the drawing. These were variable in length, the usual length of the shorter ones ranging from 0.2 to 2 inches. But branches 6 inches to 2 to 3 feet long were also common. The shorter rootlets were often unbranched, but longer ones (mostly those over 1 inch in length) were rebranched with 20 branches, 0.1 to 1 inch long, per inch. These longer sublaterals were again rebranched. Often the larger branches on the main roots were 1 to 1.5 millimeters thick and branched like the main root. Thus, dense masses of roots and rootlets ramified the soil. The root network was especially dense within a radius of 6 to 10 inches from the plant. Here, in addition to the older roots, new surface roots were formed. For example, one of these only 7.5 inches long was 5 millimeters thick. It tapered-to a tip 2 millimeters in diameter. There was a total of 63 branches, many of which were profusely rebranched as shown in Fig. 5; 33 roots of this general type were found near the base of the plant, and some actually had 40 branches per inch! Some aerial roots, as yet without branches, extended 2 to 4 inches into the rootfilled soil. All of the surface roots were very turgid and brittle. In fact, the denseness and abundance of the rapidly growing roots can scarcely be overemphasized. Fig. 5.--One of the younger and shorter but densely branched roots of corn. Maturing Plants.--Late in August a final examination was made. The plants had an average height of 5.3 feet; some stalks were 6.5 feet tall. The leaves had not increased in average size but there were more of them owing to the development of the tillers, some of which were now as large as the parent plant. Only a few of the basal leaves had deteriorated and the plants were in good condition. The one selected for detailed study had five stalks and seven ears. The kernels were well filled but the husks were only beginning to dry. The root system had developed proportionately to the tops. Branchlets extended to the root tips and indicated that growth was practically complete. The surface area delimited at the former examination (approximately 3 feet on all sides of the plant) had not been greatly extended, but the soil volume, of which this was one end, had been greatly extended in depth. A working level of 50 inches was found and numerous roots ended between 60 and 68 inches, which was the maximum depth. After continued study a typical plant was selected and its root system worked out in the usual manner. A total of 78 main roots (i.e., roots of large diameter, 3.5 millimeters or more) arose from the base of this plant and 123 smaller ones. Those of the latter group ranged from 0.5 to 2 millimeters thick. Nine of the large main roots extended outward 18 to 42 inches from the base of the plant in the surface soil and then, turning downward, reached depths of 3 to 5 feet. 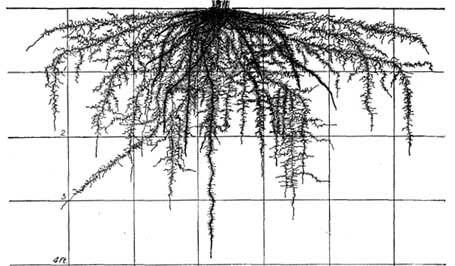 Twenty-five main roots (20 to 30 on other plants) extended outward only a short distance from the base of the plant or, more usually, ran obliquely downward in such a manner that even at their ends (at depths of 3.5 to 5 feet) they were only 12 to 18 inches from a vertical line from the base of the plant. Figure 4 shows that some of these more vertically descending roots were half grown at the earlier examination. But many more of them had developed at this time. The remainder of the large roots consisted of prop roots and others with a large diameter (not infrequently 5 millimeters) which mostly extended only a short distance, usually not over 12 inches, from the base of the plant. As regards the remaining very numerous but smaller roots, these extended outward almost entirely in the surface foot of soil. Here they ended at distances of 3 to 24 inches from the base of the plant. Thus, the surface soil, especially the first 10 inches and within a radius of 9 inches from the crown, was filled with a dense tangle of roots, a network so complex and so profuse that there seemed actually to be more roots than soil. Certainly no moisture could evaporate from this soil volume. Indeed it seems many more roots were present than were necessary to exhaust it of its water and readily available nutrients! 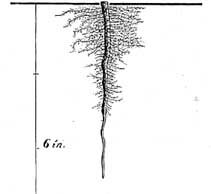 Figure 6 shows a surface view of this root complex, the soil having been removed and the roots exposed to a depth of 12 inches. Fig. 6.--Roots of a mature plant of sweet corn found in the 12 inches of surface soil. They are shown in their natural position after the soil had been rremoved. Where the larger roots apear to end they really turned downward into the deeper soil. As regards degree of branching, it was indeed profuse. On the main, long, widely spreading roots, laterals occurred as before at the rate of 8 to 12 branches per inch, but 30 branches per inch were not uncommon. Even at depths of 4 feet or more 5 to 10 short branches per inch were usual. 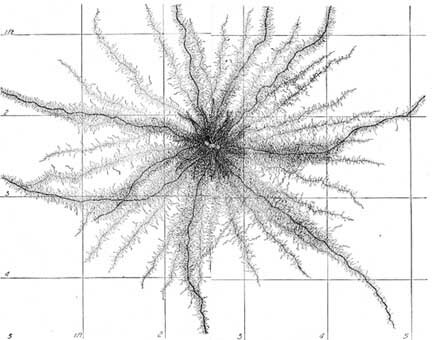 The branches, moreover, were, in general, longer than at the earlier examination; in fact long branches (over 5 inches) were much more numerous, and the network of branches due to rebranching much more profuse. Similar branching occurred on the long, rather vertically descending main roots, but these, like the others, were less profusely branched below 3 feet. From the tough, yellowish, cord-like roots many long branches filled the soil. Some of these in the deeper soil were quite yellow in color. Branching of the finer surface laterals occurred at the rate indicated in the drawing. Here also the length of the branches and their degree of rebranching are shown in detail. If one can visualize the root system of the sweet-corn plant, he will see the surface 12 inches of soil near the plant filled with a tangled root mass even to within 1 inch of the soil surface. Extending beyond this to distances of 18 to 42 inches, main horizontal roots pursue their course. From these long branches extend into the deeper soil and finally the main roots themselves turn downward and penetrate deeply. Below the 10-inch level, roots are still abundant, but not so dense, until the working level at 50 inches is reached. Still deeper roots are fewer but occasionally occur at a depth of 68 inches. The main vertical roots penetrating downward, spreading 12 inches or more on all sides of a vertical line from the base of the plant, go thoroughly fill the soil that in comparison there seems to be more or less of a gap between this soil volume and that so completely occupied by the main horizontal ones. In some plants this is less pronounced since, as in field corn, the roots spread at wider angles and thus thoroughly occupy this portion of the soil volume. Summary.--Sweet corn is an important vegetable crop. The primary root system, unlike that of field corn, usually consists of a single, much-branched root. During the first few weeks this grows outward and downward over 1 inch a day. The secondary root system consists of numerous horizontally spreading roots which arise from the nodes of the stem just beneath the soil surface. The roots are so profusely furnished with laterals that the absorbing area; exceeds the area of the tops. In rather dry soil the absorbing surface is much greater than in soil that is more moist. Plants only in the eighth-leaf stage have from 7,000 to 10,000 branches. At the time of tillering both the primary and secondary root systems are still vigorously growing. The root system is composed of about 100 thick, coarse roots, about a third of which have just commenced growth, and approximately one-third as many finer ones. They spread 3 feet on all sides of the plant and thoroughly occupy the soil, interlacing between the rows, and reach a working depth of 2 feet. Maturing plants show 6 inches greater lateral spread and the soil is ramified to a depth of 5 feet. Thus, over 180 cubic feet of soil are occupied by the roots of a single plant. Branching is profuse, 8 to 30 long, much rebranched laterals occurring per inch of main root. Briefly, sweet-corn roots extend laterally more than half as far as the stalk extends upward, and the root depth is equal to the height of this rather imposing vegetable crop. Comparison with Roots of Field Corn.--The root system of sweet corn is very similar to that of field corn. Field corn is usually of larger stature, has a greater lateral spread (often 3.5 feet on all sides of the plant), and penetrates more deeply, usually to 5 and sometimes to 8 feet. This deeply rooting habit has been observed in Nebraska, 174 Colorado 68 Kansas, 105 Wisconsin, 80 Illinois, 58 and New York. 2 That it is greatly modified by irrigation, 68 drainage 32 fertilizers, etc. has also been ascertained. 104, 78, 50 The root system of sweet corn is so similar to that of field corn and the plants are so closely related that it is believed that similar modifications of the soil environment would induce like responses in root development. Further investigations will undoubtedly show that different varieties exhibit differences in rooting habit. Such information is of great scientific and practical value. For example, it has been shown that inbred strains of field corn differ greatly in the character and extent of their root systems. "Certain strains . . . have such a limited and inefficient root system that they are unable to function normally during the hot days of July and August, when the soil moisture is low." 58 Different strains show differences in resistance and susceptibility to root rot. It has further been shown that, in general, weak-rooted strains when compared with better-rooted ones, are more likely to lodge and give a lower yield of grain. 81 This is due in part to being more susceptible to injury from unfavorable environment and in part to parasitic factors. 58 Experimental evidence has also been found which supports the suggestion that selective absorption by individual corn plants may prove to be a very important heritable character. 56, 57 The relation of the root habits to cultural practices in growing the crops of sweet and field corn are practically identical. Relation of Root Habits to Crop Production.--A study of the root habit clearly shows why corn does best on a deep, well-drained soil which has an abundant and uniform supply of water throughout the growing season. Cultivation.--If the soil is well prepared before planting, the main benefits of cultivation are derived from keeping down weeds, preventing the crusting of the surface, and keeping the soil receptive to rainfall. The superficial position of the roots clearly shows why deep cultivation is harmful. Fortunately, weeds are most easily destroyed when coming through the surface of the soil by shallow cultivation such as harrowing surface-planted corn. This also breaks the soil crust, gives a drier and warmer soil, and a more vigorous crop results. Thorough preparation of the seed bed and shallow cultivation make a good combination. The harmful effect of letting weeds grow for a time is not entirely due to rapid removal of water and plant-food material by them from the soil but to the breaking of the corn roots in the deeper cultivation necessary for weed eradication. On heavy soils, however, a slight benefit from cultivation other than weed control may be gained by better aeration. As the oxygen supply in the soil air is decreased, rate of growth diminishes in a soil with a high temperature. 22 For example, corn roots, in a soil atmosphere of 96.4 per cent nitrogen and only 3.6 per cent oxygen, at a temperature of 30°C. grow about one-third as rapidly as at the same temperature under normal conditions of aeration. But at 18°C., growth is increased to about two-thirds the normal rate at that temperature when the soil is well aerated. 21 When one considers, the enormous mass of respiring roots, it is clear why an abundant air supply is needed. 27 But in most soils the air is changed naturally by diffusion, displacement, renewal due to rains, etc. An examination of the half-grown root system explains why late tillage, except for weed eradication, is of little value. The roots are so well distributed through the soil that little moisture will escape even from uncultivated land. Hilling at the last cultivation not only acts as a mechanical support to the stem but also encourages the development of brace roots which are an additional aid in holding the plant up against strong winds. But, if hilled early, later cultivation partly removes the hill and exposes a portion of the root system. Even shallow cultivation cuts many of the roots and deep cultivation is very harmful and greatly decreases the yield. Cultivation of field corn to a depth of 4 inches during a period of 9 years in Ohio gave a decreased yield every season but one, as compared with similar cultivation to a depth of 1.5 inches. The average decrease per acre was 4 bushels of grain and 183 pounds of fodder. 179 In Indiana, very similar results have been obtained. 90 In Missouri, deep cultivation compared with shallow reduced the yield 6.5 to 13 bushels per acre. 166, 54 The harmful effects of deep cultivation are always more pronounced during years of drought. In Illinois where the roots were pruned to a depth of 4 inches at a distance of 6 inches from the hill, the yield was decreased 17 bushels per acre. 109, 181 During a period of 8 years, the average yield of corn in a cultivation experiment in Illinois was 39.2 bushels on plats cultivated three times; 45.9 bushels where no cultivation was given but where the weeds were kept down by scraping with the hoe; and 7.3 bushels per acre on plats where the weeds were allowed to grow. 109 When the plants begin to shade the ground, wind movement is reduced, evaporation is decreased, and the thick network of roots near the surface absorbs the water and prevents its escape into the air. As a result of a series of cooperative experiments carried on in 28 states during a period of 6 years, it has been found that as large yields of grain were gotten by keeping down the weeds by cutting them at the surface of the soil without forming a mulch as by cultivation. 25 Further analysis of these findings showed that in subhumid or semiarid sections the average yield from the uncultivated land was only 85.9 per cent of that from the cultivated. Thus, the greater need for cultivation in such sections, compared to humid ones, is illustrated. The yields without cultivation, moreover, were found to be relatively higher on sandy loams and silt loams than on clays or clay loams. A difference of 13 per cent was determined between the sandy loams and clays. 109 For the highest yields, cultivation should never be deep enough to injure the roots seriously. They should be allowed fully to occupy the richest portion of the soil, which is usually the furrow slice. The proper type of cultivation is one which is deep enough to kill the weeds but shallow enough to reduce root injury to a minimum. Fertilizers.--Hill fertilizing of corn promotes more vigorous early vegetative development with earlier tasseling and earing. The observation of farmers that corn fertilized in the hill sometimes suffers more from drought than when grown in soil where the fertilizer has been uniformly distributed may be explained by a study of root extent in relation to tops. Although no differences were found in the actual abundance, depth, or lateral spread of the roots, the more luxuriant plants resulting from hill fertilizing had a relatively smaller root system. 104 This may also explain why, in Missouri, applying fertilizer in the hill or row yields good returns during seasons of abundant rainfall, but in dry seasons there is more danger that the fertilizer may cause the corn to "fire" than when it is applied ahead of the planter with a fertilizer drill. 54 Because of the extensive development of the roots of practically all cultivated plants, it seems probable that the chief effect of hill manuring is to promote vigorous early growth and that the plant receives little benefit from the manure at the time it is completing its growth and maturing its seed. Experiments have shown that corn absorbs nitrates and undoubtedly other nutrients at all depths to which the roots penetrate. 174 Competition for water and nutrients from the interlacing roots of plants in the same hill or in adjacent rows is often very severe. These root relations should be considered in the rate of planting especially on less favorable soils and in dry climates. Suckering.--The removal of suckers or tillers from the base of the sweet-corn plant is a very old practice, formerly followed to a greater extent than it is today. It has been largely discontinued in field-corn culture. Experiments in Nebraska 98,107 and Missisippi 117 have conclusively shown that it materially decreases the yield. The practice is not followed by a large per cent of sweet-corn growers. Experiments at Ithaca, N. Y., during a period of 5 years, show that the removal of the suckers does not accomplish the results usually claimed for this practice, viz., increase of yield, larger yield of high-grade ears, larger size of ear, and earlier and more even maturity. Golden Bantam, which suckers or tillers rather freely, and Stowell's Evergreen, which produces relatively few suckers, were used in the experiments. 159 The data for the 5-year average show a reduced yield from removing the suckers, the greatest reduction occurring when they were removed at the beginning of tasseling. The results show, moreover, that removing the suckers reduces the yield of stover, a valuable by-product. "Under most conditions the practice of suckering is not justified and is more likely to result in loss than in gain. The later the suckering, the greater is the chance for loss." 159 An examination of Figs. 4 and 6 will make clear that this is quite what might be expected. The larger the sucker at the time of removal the more the balance between roots and stalks would be upset and also the greater the reduction of the food-manufacturing area of the plant.